China, America and Our Warming Planet, by John Kerry in the New York Times opinion pages. Kerry writes, 17 years after he was a member of the Senate unanimously passing he Byrd-Hagel Resolution, "in climate diplomacy, as in life, you have to start at the beginning, and this breakthrough marks a fresh beginning." ... it appears that these agreements on their own give us less than a 1% chance of keeping the rise in global mean temperatures below the iconic 2 degC level in 2100. ...assuming the rest of the OECD matches the US’s actions of a 28% cut by 2025 (with the EU cutting by 40% as before), and the rest of the developing world matches China’s pledge to stop increasing emissions by 2030. The chance of staying below 2degC in 2100 rises to 1.1%... These pledges are only the first step on a very long road. The statement reiterates policies China and the United States have been developing on their own and contains no new binding limits on greenhouse emissions. ...The baseline, scale and timing of the reductions are essentially the same as those proposed in the Clean Power Plan, published by the Environmental Protection Agency in June. ...Crucially, the joint statement reaffirms "the principle of common but differentiated responsibilities", which has been the sticking point in international negotiations since the Kyoto Protocol in 1997. ...For China, climate action remains subordinate to the primary goals of economic development and political and social stability. The joint statement enshrines China's right to tackle climate change in its own way and at its own pace. 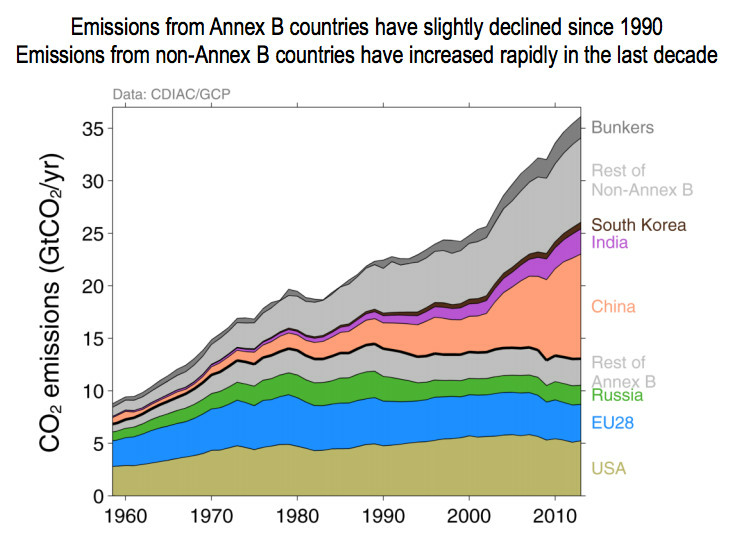 .. there’s the matter not of when Chinese emissions peak but where they peak. Do they peak 25 percent above current levels? 15 percent? 10 percent?... At least one big hint at where Chinese leaders hope to land should come next year if they announce a carbon intensity target (something they seemed to indicate was in the works at the UN in September). One way of getting some insight might be from a recentMIT-Tsinghua study that models a scenario with Chinese peaking in 2030. It uses a $38/ton carbon tax to get there and peaks at 17 percent above current levels. It would not be a surprise if that analysis was one of many that informed Chinese decision-making. At the September United Nations climate summit in New York City, Vice Premier Zhang Gaoli also said the country would adopt a climate change plan to reduce the country’s carbon dioxide emission intensity (CO2 emissions per unit of gross domestic product) between 40% and 45% by 2020, compared with the 2005 level. China's pledge to get 20 percent of its energy from clean sources by 2030 is genuinely audacious. "It will require China to deploy an additional 800-1,000 gigawatts of nuclear, wind, solar and other zero emission generation capacity by 2030 — more than all the coal-fired power plants that exist in China today and close to total current electricity generation capacity in the United States." That's staggering — and it remains to be seen if China can actually do all that. I think the world knows the President of the United States can't make any binding commitments. ...the U.S. is sending a message to those countries, and to the pro-fossil fuel governments in Canada and Australia, that we are serious about putting climate at the center of our international relationships. To get a message to Canada the President of the United States now goes through Beijing? Perhaps the Prime Minister should offer to shadow the commitments of China. Why is Beijing Downplaying the Supposedly Huge Climae Change Deal? ...whereas one side gave it a high gloss, the other seemed to be trying to bury it under the rug. The top story on the website affiliated with the Communist Party flagship paper The People's Daily was about Xi and Obama meeting the press -- but the article made no reference to the climate agreement. Other stories on the homepage touched on the climate statement but tended to relegate it to the latter half of the article, and omitted the American-style superlatives. The popular Beijing News, a state-run paper known for gently testing the editorial boundaries, also didn't mention the climate deal in its Nov. 12 cover story on the APEC meeting that brought Obama to China. It focused instead on the meeting's anti-corruption accord and progress on plans for a pan-Asian free trade zone spearheaded by China. There's little question that smog pushed China into the deal. Five years ago, at the international climate change summit in Copenhagen, Chinese leaders dug in their heels and demanded that the rich world cut emissions first and offer aid to developing countries to help them catch up. But because pollution has worsened over the major cities in eastern China over the past few years, creating an international embarrassment in addition to domestic health concerns, fixing the country's miserable air quality has moved to the top of the political agenda. (Even Xi admitted to checking a pollution monitor every morning.) The good news for international environmentalists is that the smog problem and the climate change problem share the same solution: reducing use of fossil fuels, especially coal. Sorry but your comments are not worth much here... there are always "naysayers" and plenty of people are down on germany's plans to move to "alternate" (read: technologically advanced) sources of renewable energy. Another way to look at it is this: Germany is accepting the pain up front to plan for the future. Germany has foresight where everybody else is only interested in the bottom line for THIS QUARTER. And yes, the fossil fuel and atomic industries are very powerful in germany as everywhere else, and YES they are doing their best to slow the progress of renewable energy technologies.